The arduino can act as a wii controller. This means with the right hardware you can make your own drum or guitar hero controller. A guitar hero simulator was implemented by Frank Zhao and others. I want to start by getting two arduinos to talk to one another on I2C. One would be receiving the I2C code just like is done with the nunchuck reader. The other would be acting as the controller. 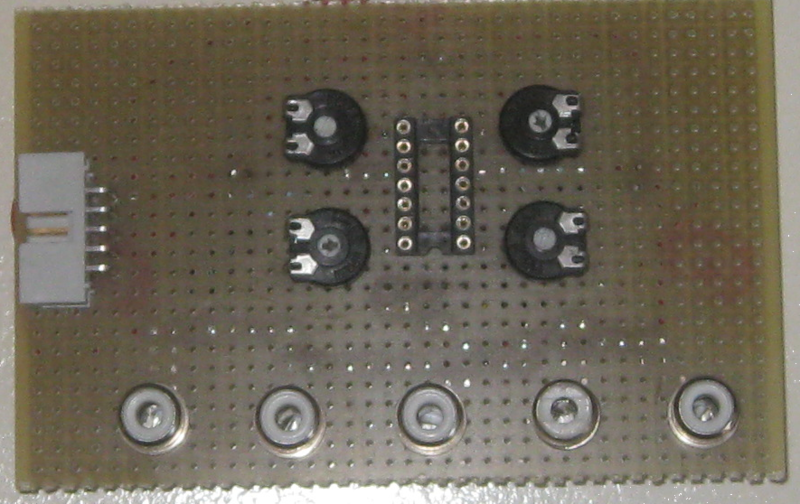 I have made the the following hardware to try to filter the piezo element signal and make them suitable for the guitar hero simulator. On this site it is suggested that some sort of filtering is needed to condition the signal. This is needed so that you do not get spurious drums coming from the multiple high/lows that a piezo element generates. This is what this looks like in real life. In it a single key is simulating a button on the classic controller. The whole coding calibration etc issues are however solved. So its a cool platform to start from. Here is an extract from the code. You can see that all that is needed is for the register bdr to be set correctly in the loop() part of the sketch. This way you can also add the other buttons etc. //  * If PushButton is pressed, pinRight will be LOW. This value is then inverted and given to variable "bdr", that represents D-Pad RIGHT button. You can download a locally saved copy from here. * Sample sketch which makes the Arduino to impersonate a Classic Controller. * a D-Pad RIGHT button press of the impersonated Classic Controller. * WARRANTIES, see the file, "LICENSE.txt," in this distribution. * They are initialized with center values from the calibration buffer. * If PushButton is pressed, pinRight will be LOW. If you want to start from the Frank Zhao software you can use the one from his site. I also ported it to arduino. It has not been tested but it does compile. You can also download it here. If someone wants to test it please let me know if it works. I'd like to thank Hector Martin for posting his encryption method! the Internet that it is impossible to attribute correctly. Guitar Hero arduino note visualizer lights our fire — Engadget This would be cool to do with SEMS sensor and wii interface. Wii Guitar Hero World Tour Drums MIDI Out interface (Arduino Style) « Jamers lair Seems to be dead link.